Are you looking to surprise your friend with a unique gift? Does your friend love to taste some of the best gourmet coffee? Do you want to present your friend with something that will reflect his or her personality and will be treasured for many years? Presenting your best friend with a gourmet coffee gift basket is the wisest gift choice that you can think of for a coffee lover. There are many things that are included in these great coffee gift baskets. It could have decaf coffee, organic as well as special flavored coffees. It might also include coffee syrups, coffee flavors and some of the best coffee beans as well. 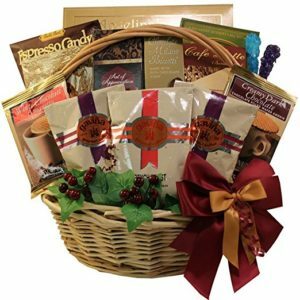 Choosing the gourmet coffee basket will not be an issue for you as you can come across plenty of manufacturers, distributors and online retailers selling these special presents. The richness and the uniqueness of this wonderful present will be etched in the mind of the recipient for a long time. According to our Coffee Supremacy team below are listed the best coffee gift baskets that any coffee lover will adore. Coffee lovers gift basket ideas and Coffee Supremacy list of the best is here for you. We hope that we will be able to help you in choosing the ideal gift. We all know what love coffee lovers but which of these baskets or boxes are best for them, we will help you to find out. An ideal present that you can give every coffee which using the Keurig Model 2.0 K-Cup Machine (we recommend K575 model) or any some other cheaper K-Cup coffee maker is the Kona coffee gift basket with Single serve variety pack. This pack contains 20 pieces of the wonderful and tasty Kona Hawaiian and Pure Kona single serve coffee cups. You can choose and packs of 12 or 24 cups. They are packed in an attractive looking box and look very neat. 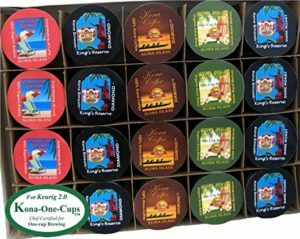 This Kona coffee K-cups gift basket can be given as a perfect gift for coffee lovers who loves Keurig’s caps. The recipient gets to taste some of the very fine collection of coffee from this pack. Each of the coffee pack is of a different roast and color and hence offers different tastes and flavors. The coffee would be dark, rich, creamy, soft, etc., depending on the roasting it has undergone. This is a very good gift to give all your loved ones on festive occasions or even on their anniversary or birthday celebrations. Especially if some of loved ones are true coffee drinker. Every coffee nerd knows for Kona coffee and will certainly be more than satisfied in the case to get this gift. The Bean Box World Coffees Gourmet Sampler is the 100% best gift you can think of to present any avid coffee lover. This gift is for coffee lovers the same as for a child when you give them a lot of favorite candies. 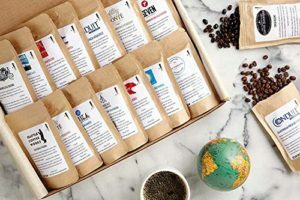 This Bean Box has hand-picked coffees from all popular coffee growing regions of the world like Brazil, Costa Rica, Indonesia, Kona, Colombia, Panama, Kenya, etc. All the coffees in this box set are ideally roasted to offer you the perfect coffee taste. You will enjoy the delicious and rich flavor in every cup of coffee you make using these whole bean coffee gourmet samplers. 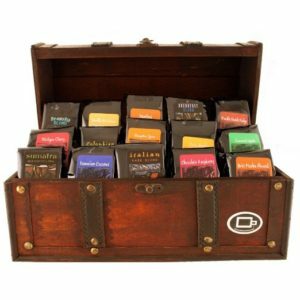 This pack contains 16 chosen gourmet coffees from all over the world and is also roasted to order. You can be assured of complete freshness in each of the coffee packs. Each bag contains 1.8 ounces of whole bean coffee and the box contains roaster rifles and tasting notes as well. This is a perfect option as a wedding favor or an anniversary favor. It is also a very good choice for corporate presentation events. In our opinion this is best coffee gift basket in our list. Real coffee aficionado always want whole bean coffee and always want new tastes to try and wants only those types of premium coffee that can meet his high standards Yes, it is perhaps little more expensive gift but we are sure that whoever gets it will be thrilled. If you want to present something special to your boss or friend or lover, then the Treasure Chest of Coffee is a good option. It contains an assortment of some of the best gourmet coffee. The chest contains specially made Arabica and flavored coffee that will make every coffee lover drool. Each of the samples offered in this coffee chest can make about 6 to 8 cups of hot and delicious coffee. All the coffee samples are freshly ground and sealed to capture the rich aroma and flavor of the coffee. Some of the coffee flavors you will find in this gourmet coffee basket are: vanilla nut cream flavored Coffee Sampler, Hawaiian coconut flavored Coffee Sampler, Crème Brulee flavored Coffee Sampler, chocolate raspberry flavored Coffee Sampler, Colombian supreme specialty Coffee Sampler, and Italian dark roast specialty coffee. This is an ideal gift that you can give for any occasion. Currently unavailable for buying 08.04.2017. This gourmet coffee basket contains some of the best flavored coffees from all over the world. It is a perfect basket that can be presented as a wedding favor. You can also give this pack as a compliment to your office colleagues or your relatives. These are 6 samples of different flavored coffee in this coffee basket. All the flavored coffees in this box are free from gluten, sugar, alcohol and lactose. Each of the Samplers in this basket is freshly ground and packed so that its flavor and aroma is arrested in the pack. All the coffee that you see in this pack is certified Kosher Pareve and they are roasted using the right roast process. This makes the flavored coffees enjoy a specialty grade. Some of the flavored coffee packets are: Café caramel cream flavored coffee, Merry mocha mint flavored coffee, Blueberry cobbler flavored coffee and English toffee and cream flavored coffee. Looking to present a coffee lover with a unique coffee basket this holiday season? 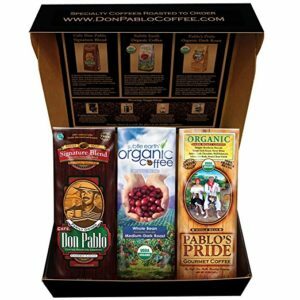 Try out the Cafe Don Pablo Special Holiday Gift Box Coffee Sampler that comes with three popular coffees. All the coffees are custom packed and printed that contains Don Pablo graphics on the box and also carried information about the specialty coffee that is inside the box. The three brands of coffee are: Char Beanz Dark coffee, Pablo’s Pride Guatemala, and Rocco’s Classic Italian Espresso. The Pablo’s Pride coffee is made using Arabica coffee beans that are roasted to medium to dark to increase the coffee flavor. The touch of roasting is enhanced in this coffee thanks to the caramelization of the natural sugars. The Espresso coffee is made using a combination of the Brazil, Sumatra and Colombia Arabica beans to offer a smooth and well-balanced coffee. The Char Beanz Dark coffee is made using the highest quality South American Arabica beans. It is dark, rich and tasty. This is a beautiful presentation that you can think of gifting your family, friends, relatives or colleagues on the most important occasions in their life. This attractive looking basket can also be used to impress your most valuable business clients. The basket contains premium coffees like Hazelnut and Vanilla coffee, French roast coffee, Gavina coffee, etc. ; white chocolate and dark chocolate wafer cookie, tiramisu filled pastry cookies, butter cookies; coffee candies and almond hazelnut biscotti. The items are shrink wrapped and are neatly arranged in a natural wicker basket to make it look as a traditional present. All the gifts inside this basket are hand crafted and are tied with a bow to show that it is ready to be gifted. The basket is accentuated with the use of ivy. This is perfect gift for older people and beautiful family gatherings, you can gift your loved ones on all festive occasions. One of the best coffee gift baskets, you can opt for your family or friend or any coffee lover this Christmas season is the Twelve Coffees of Christmas Variety Ground Coffee pack from Coffee Masters. 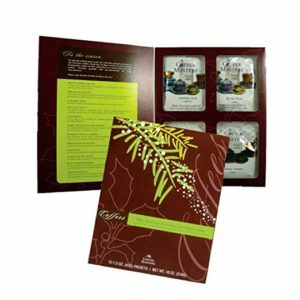 There are 12 different varieties of coffee mix in this special box that gives you the option to sip a different tasting coffee every morning during the holiday season. The recipients will enjoy every sip that they take of the specialty coffee packs provided in this unique pack. They come in a holiday theme pack that is apt for the Christmas season. Every pack is made using freshly roasted and grounded coffee and contains flavors like Cinn Ful Nut, Dark Chocolate Decadence, Jamaican Me Crazy, Turtle Sundae, Adventurer’s Blend, Hazelnut, Double Vanilla Crème, Breakfast Blend, etc. This Coffee Masters pack carries the Kosher certification and 100% Arabica coffee is used in making this 20 varieties coffee powder pack. This Coffee Sampler basket is an ideal option to give your loved ones as a wedding favor or as a birthday or Christmas present, especially if they love to sip rich and tasty coffee every morning. It is also a perfect goodie to give your friends, colleagues and clients during the Christmas season. This pack not only contains great tasting coffee, but it is also loaded with other coffee accompaniments. So, you do not have to go anywhere to make a hot coffee. The other items offered in this Coffee Sampler pack are a coffee mug, shortbread, raw sugar, creamer, biscotti and cookies. It also includes after coffee mints. There are five different and hand-picked coffees from all over the world and each day of the festive season can be started with a different tasting coffee. All the items in this pack are neatly arranged in a bamboo basket and are tied together with an attractive satin ribbon. 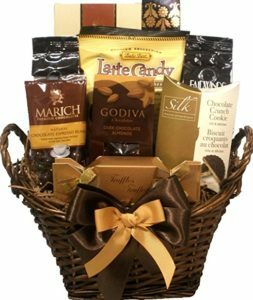 A perfect present to give your father or mother on Father’s Day or Mother’s Day or on festive occasions is the Coffee and Chocolate Lovers Gourmet Food Gift Basket from Delight Expression. This wonderful gift basket comes with a combination of gourmet coffees, espresso beans, almonds and chocolates. This pack will be an ideal treat for every chocolate and coffee lover. You will also find truffles, cookies, coffee latte candy bag, Godiva chocolate almonds, cappuccino wafer roll and wafers. The basket is neatly and beautifully hand wrapped and all the assorted coffees are hand-picked to offer the coffee drinker lingering and rich taste every morning. 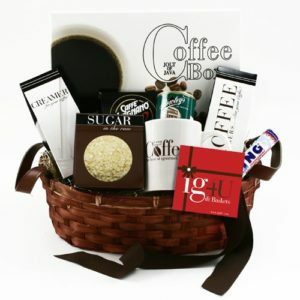 This is an adorable basket and anyone receive this gourmet coffee and chocolate basket will remember this favor for a long time. This is a premium goodie that you can give your relatives, friends, colleagues, clients or business mates. 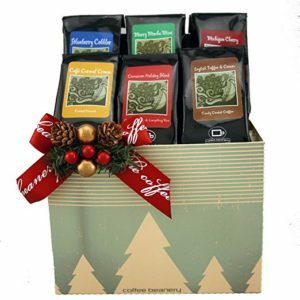 There are plenty of options on offer when you do an online search to find the best coffee gift baskets. By doing a thorough research you will be able to find the right combination of items in the gourmet coffee gift baskets to give your loved ones, business clients, friends or colleagues. 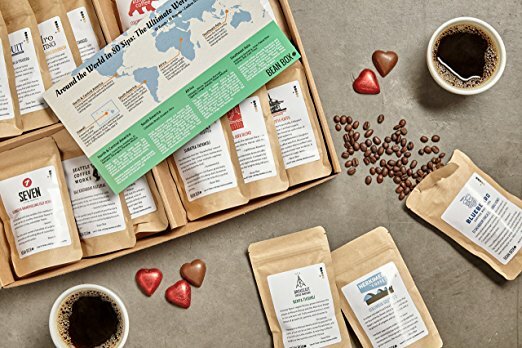 You are sure to find presentation boxes and baskets containing assorted coffees from all popular coffee growing regions of the world and they come in a variety of packs. So, choosing one basket that suits the recipient and also fits within your budget will not be a hassle. Spend time on the internet to find the most suited goodie packs to give away this Christmas season. These gifts are perfect for Mother’s Day. My mother loves to drink all kinds of coffee and I’m sure she will be a nice surprise with gourmet coffee gift baskets or with keurig k cups gift baskets. My mother is a big coffee lover and you gave me a great idea for a gift for her birthday. I will buy Kona cups pack. She have Keurig coffee maker. I know that she will be surprised and happy with this gift for her. Otherwise I have a lot of problems to choose a good gift for a loved one. I’m running out of ideas and often buy something that know they will not like it too much. But that is not problem for this year for my mother birthday, thank you. Excellent ideas. I do not know about others, but I would like to get one of these baskets.